The Kaman HH-43 Huskie is a helicopter that was used by the United States Air Force, the United States Navy and the United States Marine Corps in the 1950s through 1970s. It was primarily used for aircraft firefighting and rescue. It was originally HOK-43 and HUK-43. 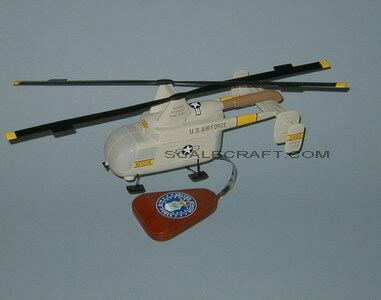 The Huskie had an unusual inter-meshing contra-rotating twin-rotor arrangement with control effected by servo-flaps. The first prototype flew in 1947 and was adopted by the U.S. Navy with a piston-engined version. It was later adopted by the Air Force in a turboshaft B and F versions. This aircraft saw use in the Vietnam War with several detachments of the 38th Air Rescue and Recovery Squadron, where it was known by its call sign moniker "Pedro", before being replaced by newer aircraft in the early 1970s. Mahogany Wood. Length 15 inches.